Syed Durali Shah Naqwi and I are bound to each other for life because we owe our lives to each other. In May, 1978, I met him standing by the road in his town of Gereshk, Helmand Province, Afghanistan, which is on the main road 90 miles west of Kandahar. Syed Shah convinced me to go with him to the towns of Nawzad and Khaway, which are in the desert and mountains north of Gereshk. There, on June 8, 1978, we were arrested as spies (which we were not). Zahir, the Governor of Nawzad, who ordered us arrested, claimed that we were headed to the mountains of Central Afghanistan, where we were going to recruit new members to join the mujahidin. We were both held in jail for three months. I escaped from jail in Lashkar Gah. I walked 40 miles across the "Desert of Death" ( Dasht-e-Margow ). I made it to the US Embassy in Kabul. I met US consular officers David Block and Martin Adams there, but the Embassy officials refused to believe my stories about people being rounded up and killed in the countryside in Afghanistan. In desperation, I tried to cross the border on foot into Pakistan, but was captured in Torkham. I spent six weeks in jail in Jalalabad, and in Demazang and Puli Charqi prisons in Kabul. Syed Shah and I were both released on September 3, 1978. During our time in jail, we never knew whether we were going to be killed or if they would let us go free (there was no third alternative). After I escaped from police custody, Syed Shah and Mullah Aminullah, whose home we had visited in Khaway, were brought in my Volkswagen beetle from Lashkar Gah to the Wezarat-e Dakhila (Ministry of Interior) in Kabul. There, Syed Shah was held in a small jail cell in Tolkif, where Nur Mohammed Tureki himself had been imprisoned in the days just before the April 28, 1978 coup in which Tureki had become the President of Afghanistan. After 11 days in that jail cell, Syed Shah was taken out, along with Mullah Aminullah. The Khad police had an order. Syed Shah asked why they were being taken out to be killed. The police said that this time they were not going to be killed. They even allowed Syed Shah and Mullah Aminullah to open the order and read it. The paper said that they were to be taken to Demazang and then back to the place from which they had come. Syed Shah was taken back to the jail in Lashkar Gah. He and I were both released in the same day, on September 3, 1978. I was released in Kabul. He was released in Lashkar Gah. A baker named Syed Daud Agha in Lashkar Gah posted a parole bond ("zamanat") so that Syed Shah would be released from jail. Syed Shah almost immediately fled Afghanistan on the passport of his cousin, who was named Syed Ahmed Shah. Syed Shah knew a Norwegian lady named Regina Frank whom he had met in Afghanistan. She sponsored him to Germany. After a few months in Germany, Syed Shah went to Turkey and from there to Iran. He crossed the border briefly into southern Afghanistan to Chaknasur and to village Kang near Farah. While he was with the mujahidin, he was shot in the leg in Kang. He was taken back to Zabul in Iran. In 1981, Syed Shah approached the US Embassy in Karachi and asked for political asylum. Haji Mahtab-ud-Din, the Afghan local in charge of the refugee program, had previously been in charge of the Water Department in Lashkar Gah while we were in jail there. He immediately recognized that Syed Shah was the man who had been arrested and put in jail with me. On the recommendation of Haji Mahtab-ud-Din, the case of Syed Shah was given expedited treatment for political asylum. He arrived in the US on December 18, 1981. 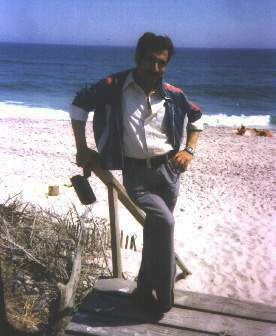 Syed Shah now lives on Beach 32nd Street, in Far Rockaway, Queens, New York, where this photo was taken. He has been able to bring 52 of his relatives to America under political asylum. Syed Shah and his wife now have 8 living children, the last four of which were born in America. (Two previous children died in Afghanistan). Haji Mahtab-ud-Din now is said to operate a supermarket in Northern Virginia. Mullah Aminullah became a clerk working in the office of the Gulbiddin Mujahidin group in Quetta, Baluchistan, Pakistan. Now, Mullah Aminullah is back in Lashkar Gah, where he sits in front of government offices writing applications for the people. Commandant Baqi, the police officer who arrested us, was killed by the Mujahidin in August, 1978, while we were still in jail. Abdul Majid Sarbaland, the governor of Helmand Province, a member of the Parcham Party, who ordered us jailed, was himself put in Puli Charqi Prison in Kabul in August, 1978. He later got out and became the Minister of Radio and Television of Afghanistan. Syed Daud Taroon, the security officer who ordered the release of myself and Syed Shah, was killed in a shoot-out between Nur Mohammed Tureki and Hafizullah Amin in September, 1979. Most of the other people involved in this incident are now dead. Zahir, the Governor of Nawzad, who originally ordered our arrest, was cut up into little pieces and his body was left to rot outside for a month. I never returned to Afghanistan. For more about this, see: History of the War in Afghanistan and The Central Jail in Kabul . For another view of the same jail, see: Leaving the Central Jail in Kabul .